The mastermind behind the toxin rampage is finally revealed! The showdown you've waited is here! Will The Flash be able to survive the toxin's effects as well? Will the Batman's back be broken again? For the most part, Paul Jenkins and David Finch have kept us hooked as well, on this fascinating storyline. Jenkins has masterfully thrown plot twists and cliffhangers left and right for the Dark Knight's initial story arc. We've been fascinated by the seductive White Rabbit and have almost deduced her identity but we're not exactly sure still. Just when you think you've figured out who the ringleader is behind the powerful criminal rampage gripping Gotham City, the story changes and the mystery continues. Batman The Dark Knight issue 6 nears the end of this intriguing storyline pulling in many guest stars (Wonder Woman, Deathstroke, etc.) as it progressed. As Batman snaps out of the toxin's effects, he orders Superman to find the Flash and advise him of how to escape it's deadly effects. 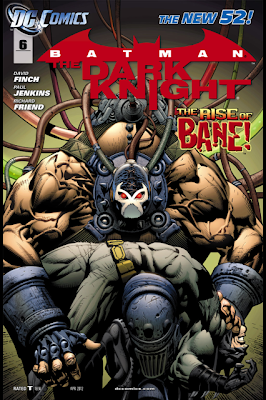 The White Rabbit pounces on the scene once again, leading Batman to the mastermind himself, Bane! The gargantuan villain dominates the ensuing battle and despite the New 52 continuity, Bane reminds the Dark Knight, that he once broke his back! Unfortunately, we leave the story in the middle of the battle as it continues next issue! 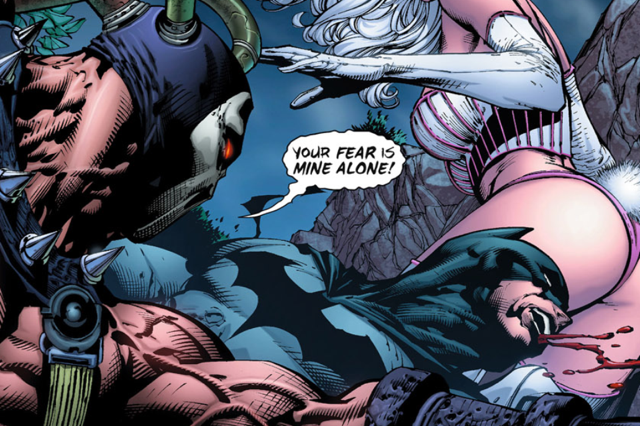 Overall, the Batman The Dark Knight team has graced readers with this superb storyline. This is the Batman, you've come to expect. That despite setbacks, his overall fortitude hasn't been broken. He doesn't need toxins to continue his fight against evil and the inspiration of his parent's death, powers his determination. No matter how much psychological damage, Scarecrow and Bane, the Dark Knight remains focused, determined and fights on. The writing and the top notch artwork have left us enthralled every month. I have a feeling there will be more twists and turns ahead so stay tuned indeed! The Bad: Another cliffhanger ending. Whoa, is that Superman's new outfit?